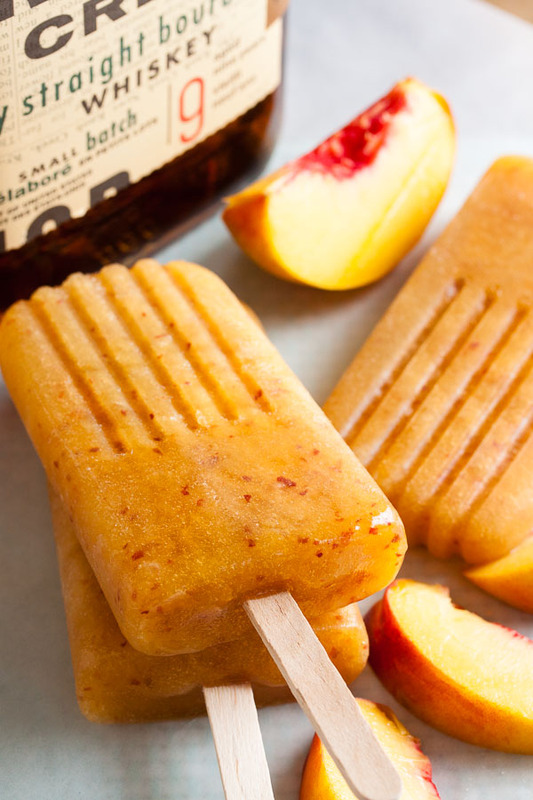 Peach Bourbon Popsicles | wanna come with? 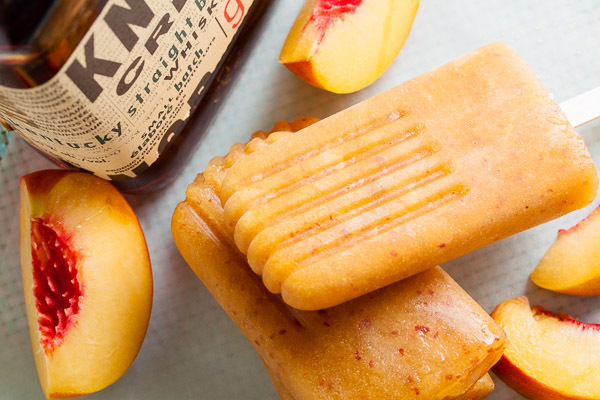 Something about the combination of peaches and bourbon just sounds so right. I think it’s because it’s evocative of the southern states. Kentucky bourbon & Georgia peaches. Well I’m nowhere near there, so while I am using Kentucky bourbon (YUM), these are home-grown BC peaches. I don’t know how we compare to Georgia, but BC, especially the Okanagan, is well known for its fruit (and wineries!). If you ever want to take a road trip in the summer, you’ll find fruit stands everywhere (and wine tastings!). And if you time it just right, you can even buy fresh buttered corn on the cob at the side of the road. Now that’s my kind of road trip. I live in a great province, and I’m very spoiled in my neighbourhood. Actually my whole city is spoiled. There are so many great little stores that carry local produce, and there’s a weekly farmers’ market just a few blocks from me. Every week I go planning to just buy one or two things, and every week I leave with a backpack so loaded full of stuff I can barely make it home. Yeah, I go a little overboard. But it’s all so gorgeous! All the heirloom vegetables (especially the tomatoes and beans), in all the colours under the sun. And even the fruit. I’ve mentioned that I’m not a big fan of most fruit (sacrilege, I know), but I can never pass up the nectarines when they’re in season. And since I had this recipe in mind, I picked up a few peaches from the same farmer. 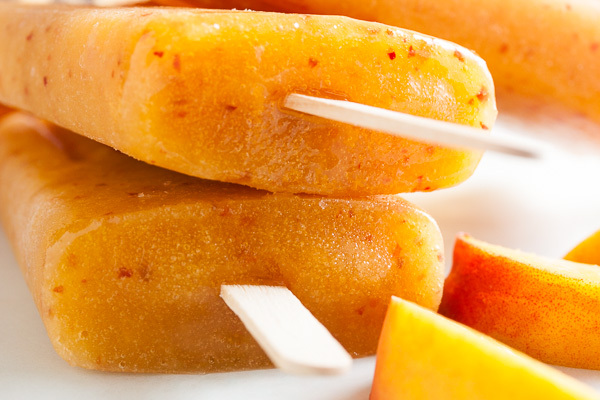 If you have perfectly ripe, juicy peaches, you can use them as-is in this recipe. If they’re not quite ripe and you don’t want to wait, you can roast them to bring out their natural flavours. Personally, there was no way I was turning on my oven this weekend, so it’s a good thing these peaches were perfect (have I mentioned how much I love my farmers’ market?). Note: In my experience, the best way to cut a peach or nectarine is to cut around the pit, much like with an avocado. 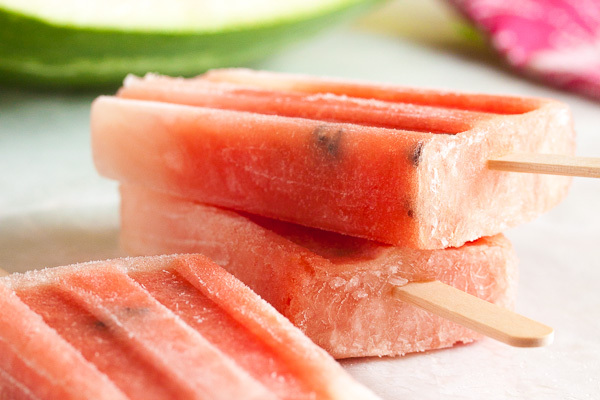 Go all the way around the fruit, stem to base, and then again to form 4 wedges. Then just angle your knife between the wedges and they'll pop right off the pit. You'll get all the fruit with no waste! 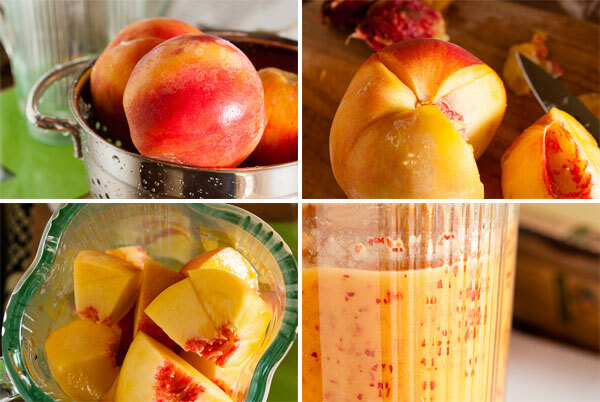 If your peaches are ripe and juicy, go ahead and quarter them for the blender. If not, you'll want to roast them to bring out their flavour. Preheat your oven to 350°F. Cut the peaches in half, rather than quarters. Place them cut side down on a baking sheet, and bake for about 20 minutes – until the skins and flesh have softened. 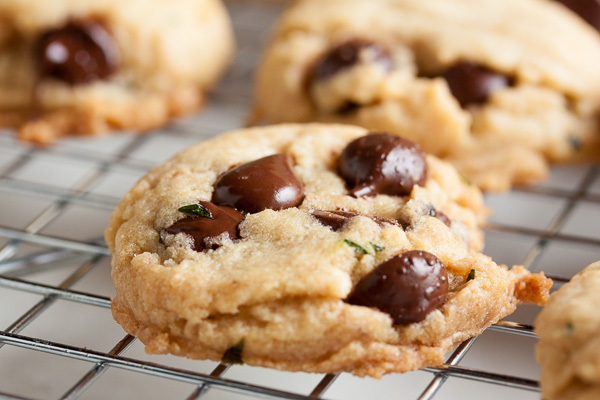 Remove from the oven and allow to cool. Combine the sugar and water in a small saucepan and stir over low heat until the sugar has completely dissolved and the liquid is clear. This will just take a few minutes. Remove from the heat and allow to cool. You should end up with about 3/4 cup of sugar syrup. Combine the peaches and lemon juice in your blender and purée. 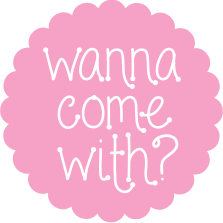 You can make it as smooth or chunky as you like. Transfer the puréed fruit to a large measuring cup or a bowl with a pour spout. Add the sugar syrup and bourbon and stir well to combine. 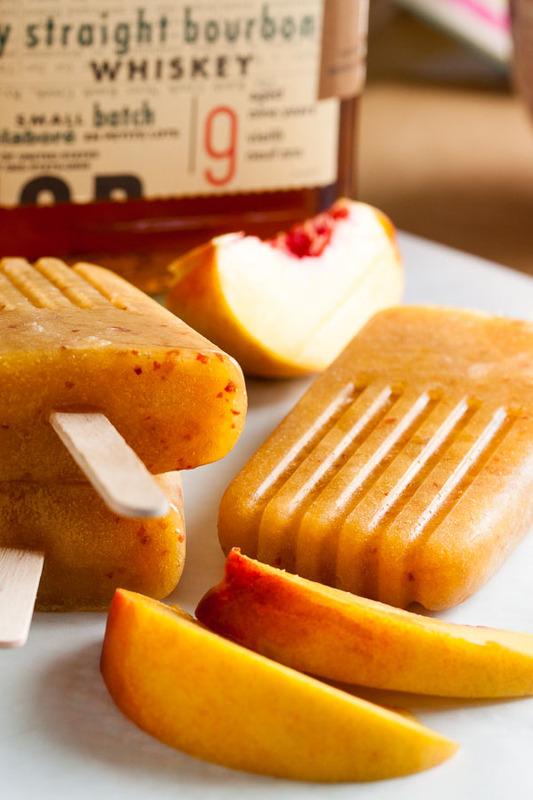 Taste it at this point – it should be sweet, and you should be able to taste both the peaches and the bourbon. 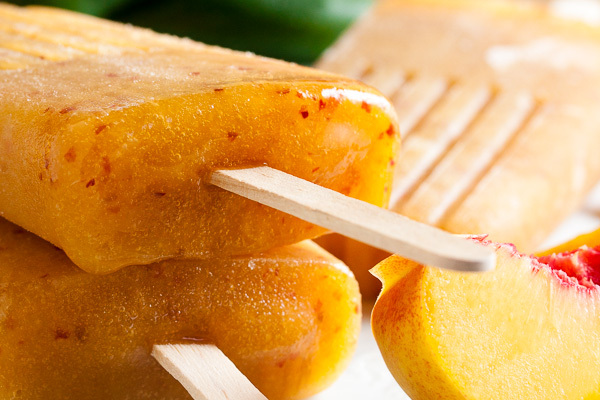 Pour the mixture into your popsicle moulds and freeze for about 5 hours. Enjoy!